When I think about vegetarian food, I feel the need to be more creative and try new things with vegetables. This is often so that my daughter also enjoys the food and does not throw tantrums about having to eat vegetables! I prepare Soya chunks from time to time… not too often, but it is a nice change from meat. Usually I prepare it as spicy gravy but this time I thought of trying something new. 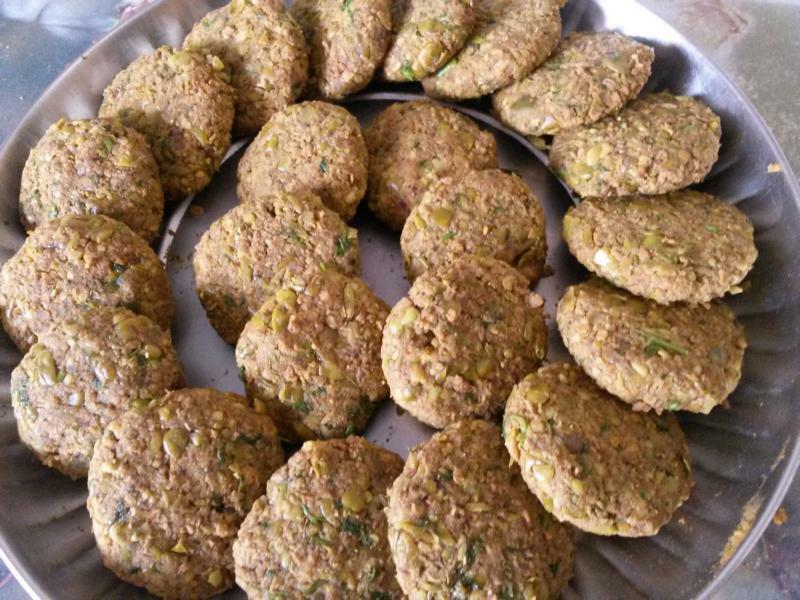 So I added a few other vegetables – an extra dose of ‘healthiness’ and made some cutlets. I was pleasantly surprised by the taste and texture. It turned out pretty well. 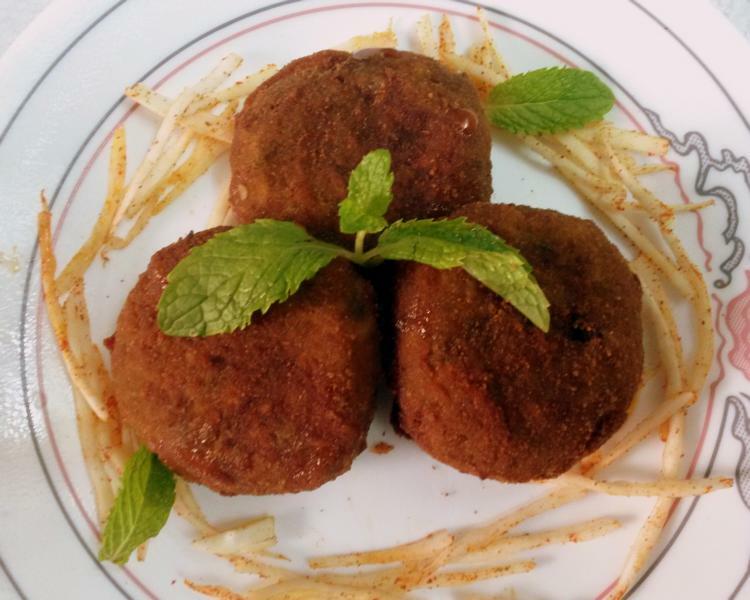 I have shared the recipe for beef cutlets before, this is quite similar in method. Again this one needs a bit of preparation, nothing heavy duty though. If you have worked with Soya chunks before, you know that they need to be hydrated. I normally boil it in water for 5 minutes and let it soak till the water cools down. Then drain the excess. Do you use another method? 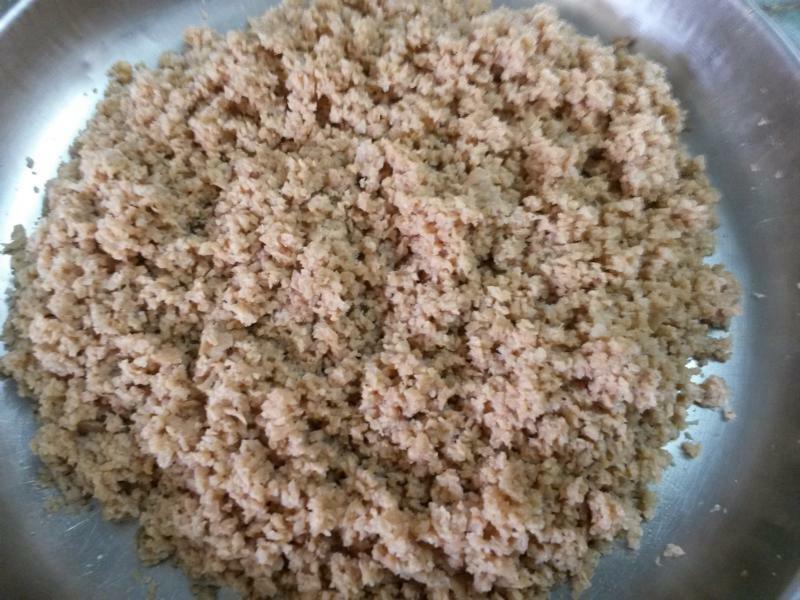 Mince the soya in a food processor till you have grainy soya that looks like minced meat. I used potato, carrot and peas alongwith the soya. You can throw in other vegetables you like. Make sure to cook them well and mash it to fine consistency with no chunks. 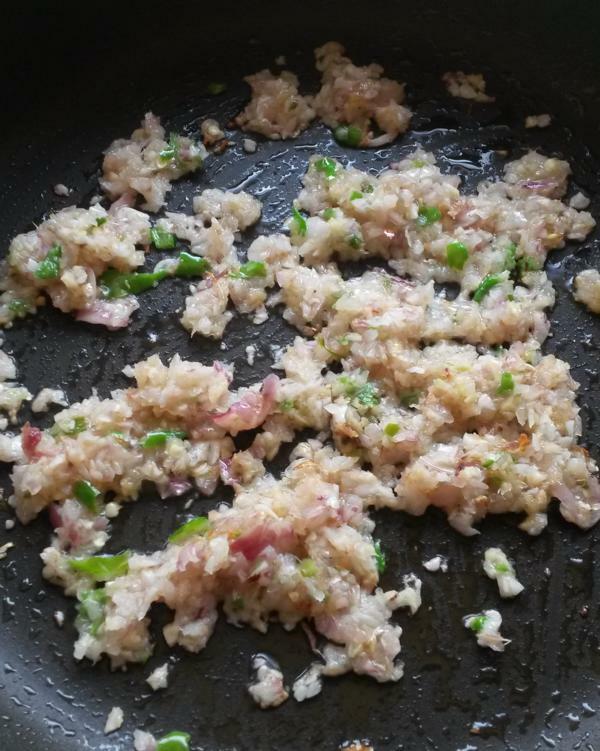 In a shallow pan, fry finely chopped onions, ginger, garlic, green chillies and curry leaves. When the onion starts to brown, add the spice powders – pepper, red chili, turmeric and garam masala, mix well, fry for a minute. 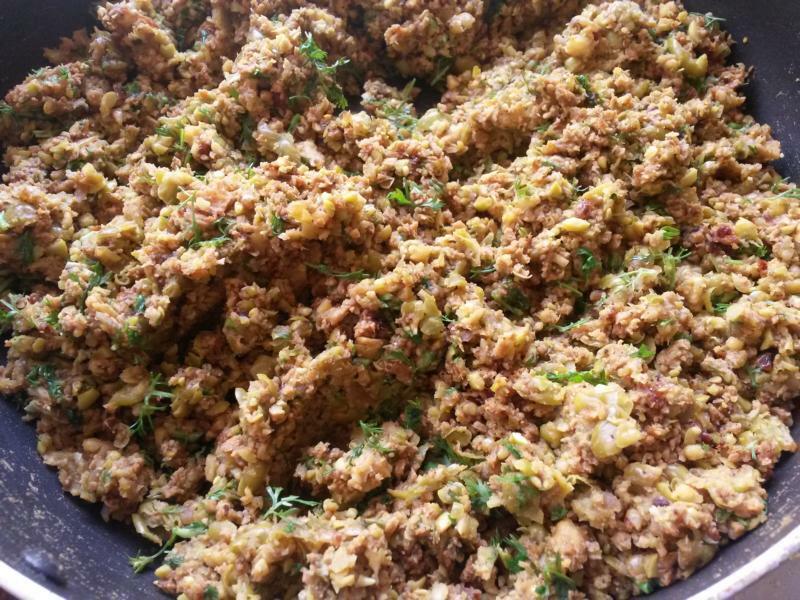 Add the minced soya and the mashed vegetables, alongwith the coriander and mint leaves to the pan, salt and mix well. Let the mixture cool down completely before proceeding with the next step. Take small portions of the soya mixture and shape them into flat ovals or rounds. Cutlets should not be too small. For binding, I used cornflour instead of egg to keep this completely vegetarian. Mix the cornflour in around 1/4 to 1/2 cup water. Dip the cutlets in the cornflour batter, roll in breadcrumbs and deep fry till brown. If you do not want to deep fry, then you can opt to shallow fry this in a nonstick pan with little oil or bake them. Fry till both sides turn brown. Best enjoyed hot with tomato ketchup or mint chutney. Cook the peas, potato and carrot with salt and 1/4 tsp turmeric powder in a pressure cooker till one whistle and switch off flame. Drain out the excess water and mash the vegetables. Prepare Soya chunks as mentioned above, mince the soya in a food processor and keep aside. In a pan pour some vegetable oil and fry the onions, green chilli, ginger, garlic and curry leaves and once the onions begin to turn brown then add the powders and mix well. Next add the minced soya then the mashed vegetables and the mint and coriander leaves. Mix well. Add salt to taste. Let the mixture cool down. Meanwhile mix the cornflour in around 1/4 to 1/2 cup water. Take small portions of the soya mixture and shape them into flat ovals or rounds. Cutlets should not be too small. 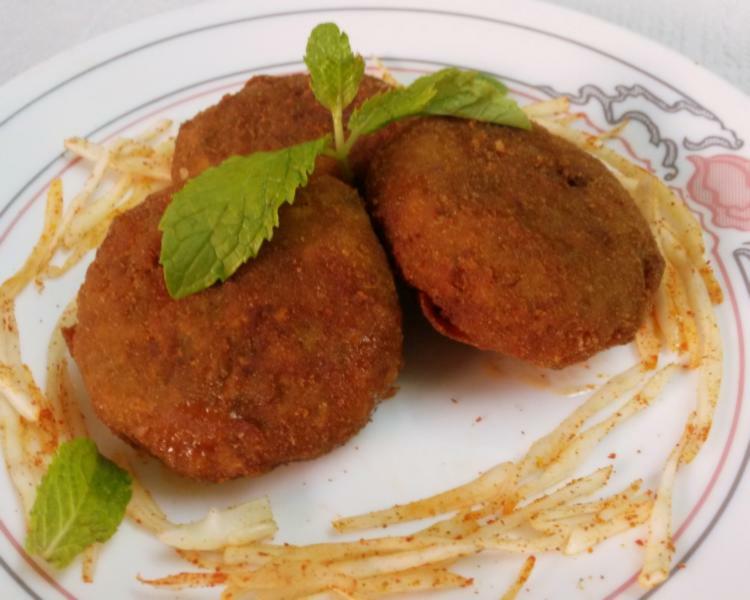 Dip the cutlets in the cornflour batter, roll in breadcrumbs and deep fry till brown. If you do not want to deep fry, then you can even shallow fry this in a nonstick pan with little oil or bake them. Fry till both sides turn brown. Oh they look just yummm! Thank you Aishwarya! Have a good weekend. Thanks for stopping by Aiswarya. Happy cooking!!! I love vegetable cutlets. these sound delicious! Thanks for stopping by Vidya and hope you have a plesant day! Thank you Vidya! Have a nice weekend. Thanks. Yes… Good way to get those proteins into kids! !